Today, we will hear a lot about giving thanks, and giving, and family, and food, and sales, and consumer demographics, and (if you live in the Northeast) snow. There is always a lot of talking and yes, I could rant about consumerism, commercialism, and the basic cheapening of values. But I want to instead talk about the idea of Thanksgiving. The idea of setting aside a specific day for giving thanks is not new; even before Lincoln’s proclamation in 1863 there were days dedicated to giving thanks. 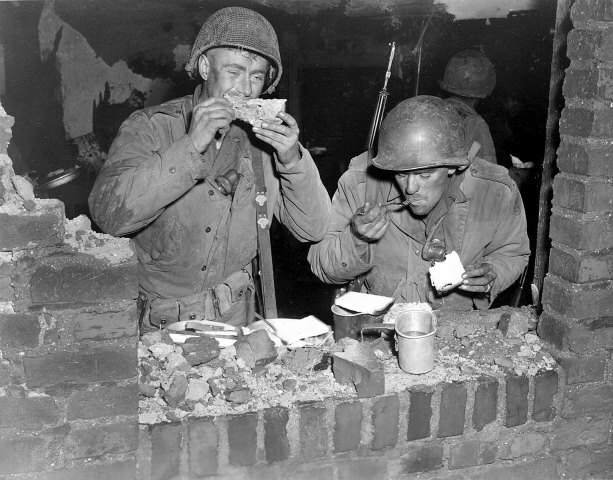 Most of these days were occasional rather than regular days set aside for giving thanks, and most were dedicated to the celebration of military victories. Upon the fall of Louisbourg in 1744 and the conquest of Quebec City in 1759, the entire Northeast and mid-Atlantic held days of thanksgiving for the triumph of British and colonial arms. This idea may strike some as odd: having a day giving thanks for the brutality and horrors of war. But there’s more to it than that. Last year I spent Thanksgiving as all holidays in a combat zone are spent: in full kit, because it’s always cloudy with a chance of rockets, and eating dust-infused KBR “turkey.” It was not a day that stood out in my mind as we were only a little over a month into our tour. This morning, I woke up. In my bed. I rolled over. I put out my arm, a whole arm, with all five fingers, and I touched my wife. That’s all. The simplest thing in the world, but God, am I grateful for it. It could be so different. For many, they don’t even have that arm. They aren’t in their bed because they’re still in the hospital. Their wife or husband isn’t there because years of deployments have ripped their marriage apart. Some cannot, because they’re still there, in whichever combat zone we’ve asked them to go to. As I see it, days of thanksgiving were not for celebrating the war or battle: they were for celebrating that the war or battle was over. That the soldiers could come home now. May you and yours have a happy Thanksgiving.